The 60" High Density Baler produces cardboard bales that weigh approximately 1000 pounds. An excellent baler to bale not only cardboard, but also PET, newspaper, shrink wrap, clothes and many other recyclable or waste items. With the 7" cylinder upgrade package, cardboard bale weights can reach over 1,200 pounds, maximizing space and possibly even recycling profits. 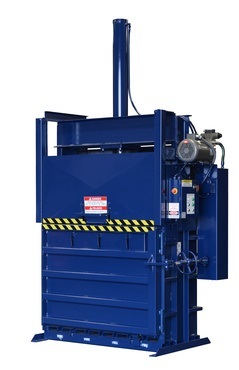 This High Density Baler is a great selection for a variety of recycling materials. *For baling strictly plastic wrap it may be helpful to add the Shark's Teeth option. 60-1548 Product meets or exceeds all ANSI Z245.5 and OSHA standards. 60-1548 Structural frames reinforced in high stress areas, plus other heavy duty 'extras'. A = 68" B = 80" C = 54" D = 108" E = 143" F = 45" G = 102" H = 76" I = 54"